There’s nothing like cooking a great meal outside. A hot grill, warm sunset and a beautiful green garden… what more can you want? 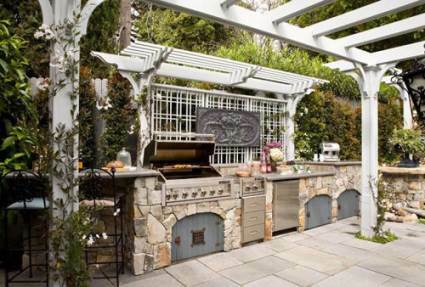 To enjoy the spring and summer to its fullest, a lot of people invest in an outdoor kitchen. 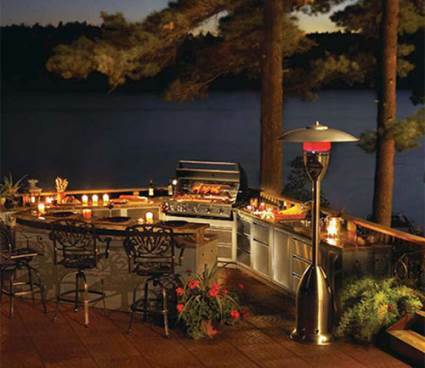 An outdoor kitchen is more than a place where you can cook and eat – it’s a place to entertain. It’s perfect if you’re having friends or family over. 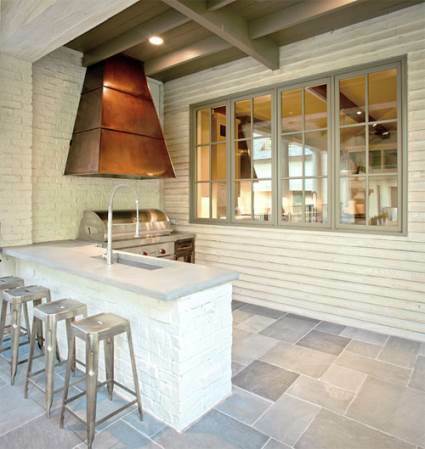 1) The biggest difference between an indoor and outdoor kitchen is the environment (well, duh…). 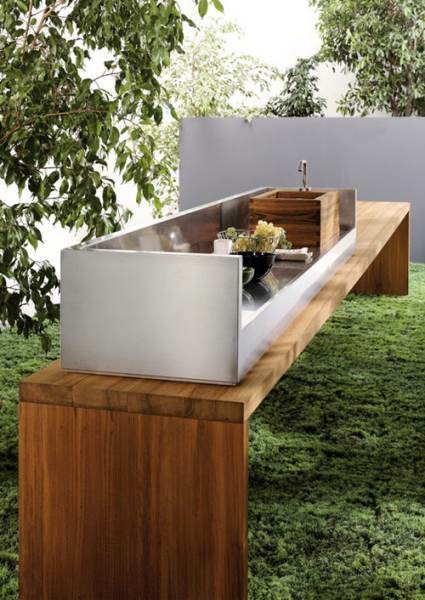 Outdoor kitchens are often exposed to the elements, such as rain, snow, freezing temperatures… Durability is really important in this case, especially if you have an open air kitchen. 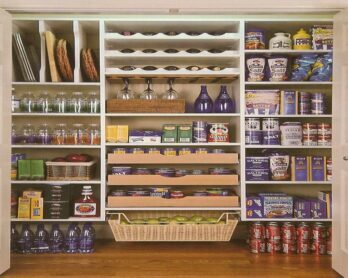 2) Selecting materials should be done wisely. In climates with considerable freezing and thawing you should avoid tile countertops. Highly porous materials should also be avoided. 3) Keep an eye on your budget. 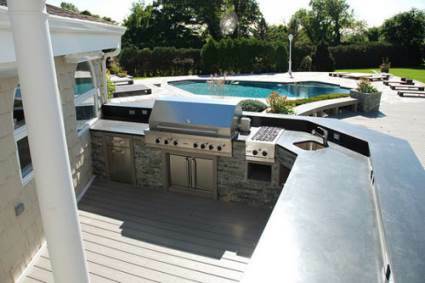 Outdoor kitchens can range anywhere from $3000 to over $30000. 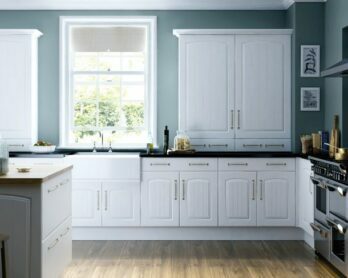 Deciding how big you want the kitchen to be and which appliances you need can help you estimate the building cost. 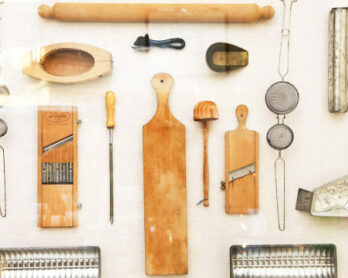 If you plan on frequently cooking outdoors, you can perhaps invest a little bit more. 4) Getting electricity, gas and water to your kitchen can also be problematic. Make sure you take extra expenses for rewiring, pipes, etc. in account. 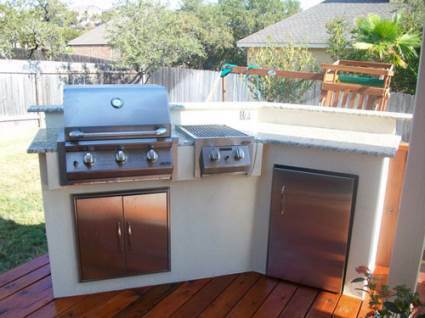 This outdoor kitchen has a beautiful copper hood and a large stainless steel BBQ. It also has a beautiful kitchen island that is made from white bricks and a concrete countertop. 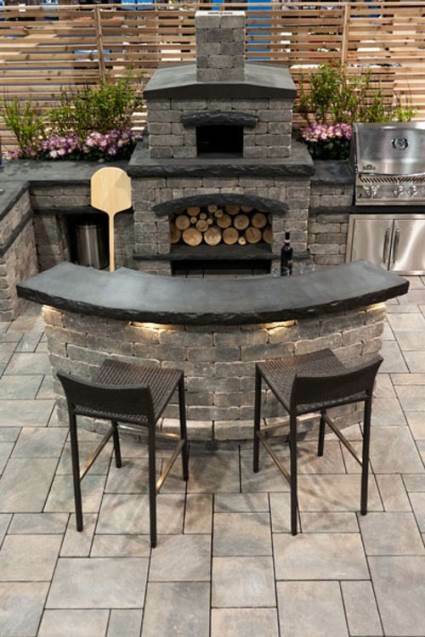 I bet everyone would want an outdoor kitchen like this! The stone oven is the real eye-catcher of this beauty. It’s perfect for baking pizzas during hot summer nights. The lights under the countertop create a nice and cozy atmosphere. 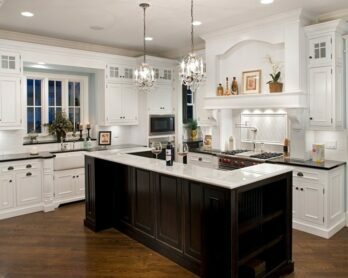 Most of the examples you’ll see on this page are more traditional outdoor kitchens. But there are plenty of modern alternatives, such as this one. 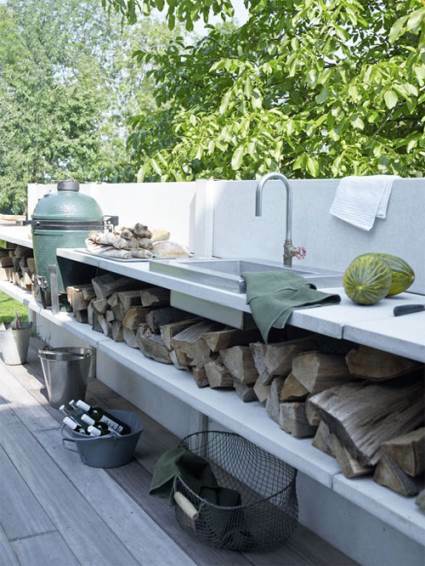 This outdoor kitchen sits on a beautiful wooden bench. I’m not sure, but I think the top of can be removed (which would be handy in the winter). 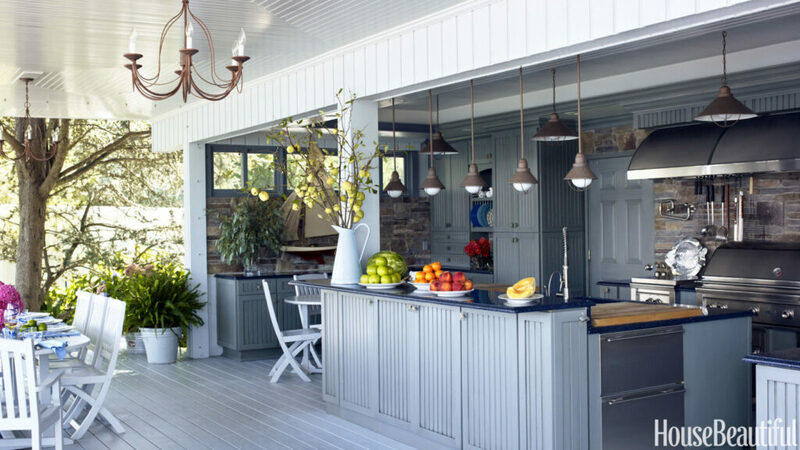 This is probably the dream of every chef: a gorgeous kitchen by a lake. 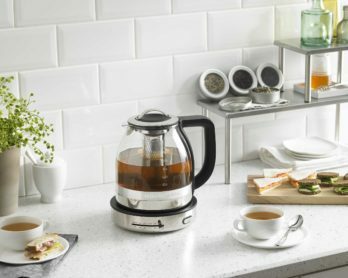 It’s the perfect place to cook a meal for friends and family. Who says you need a big outdoor kitchen? Small will do just fine. You don’t need to sacrificial half your yard to install an outdoor cooking area. This small kitchen as everything you need: a BBQ, grill, fridge and cabinet. 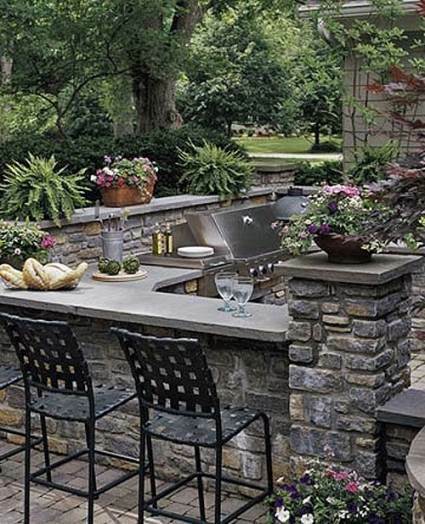 This outdoor kitchen has a built-in dining area. 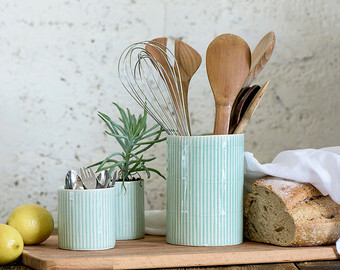 This is great if you want to chat with your guests whilst cooking. The stone design and flower pots make sure that this kitchen blends well with its surroundings. 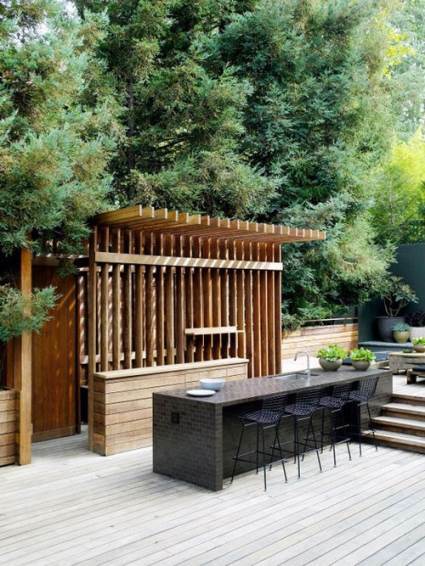 The modern outdoor kitchen below can be found in Los Angeles. It was designed by LA design collective ‘Commune’. 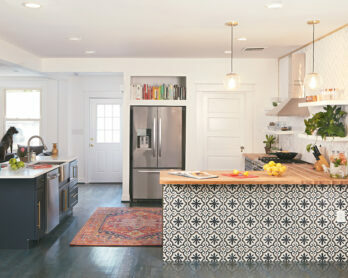 What I really like about this kitchen are the beautiful tiles that were used in the kitchen island. This Victorian-inspired beauty can be found in Los Angeles. It’s part of a complete outdoor living area, including this kitchen, dining area, fireplace, etc. The single-counter kitchen provides plenty of room for cooking, serving and storage.